Steve Jobs buries Mac OS 9 at the 2002 WWDC. If you've been using Macs for less than a decade, you may have neverexperienced the "classic" Mac OS, which was introduced with the original Macintosh in1984 and was given a mock funeralin May 2002. The original 24-bit, black-and-white Mac OS had grown intoa 32-bit operating system with 24-bit color support, QuickTime video,cooperative multitasking, and multiple users, but these were hacks toan aging operating system. When Apple acquiredNeXT in late 1996, it gained the core of what would become Mac OSX. 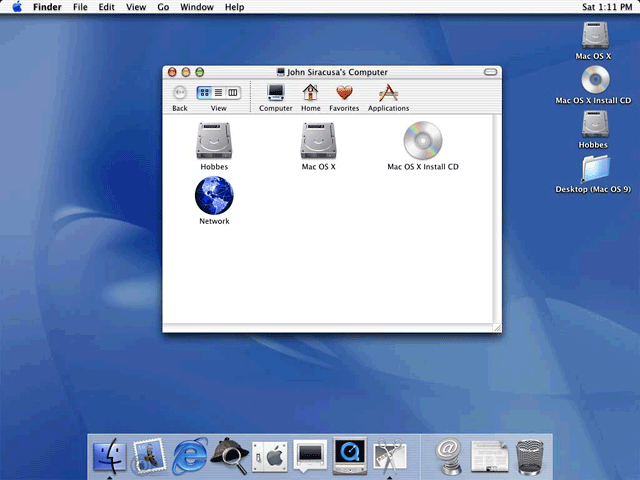 The first consumer version of OS X was introduced on March 24, 2001,and while it was certainly not yet ready for prime time, version 10.0pointed to a new Mac OS world where one app crashing would not takedown the whole OS, where no app could prevent others from usingprocessor cycles, where virtual memory was always there, and whereprograms could use all the memory they needed. For longtime Mac users, the transition to OS X might take years, andto this day some Mac users are still running the Classic Mac OSnatively while others are using it in Classic Mode within OS X. Despitethe mock funeral, OS 9 still isn't dead, but for most of us OS Xdisplaced OS 9 for everyday use years ago. Today our staff looks at the introduction of OS X eleven years ago,its development to the point where it could become the Mac's defaultoperating system, and how we dealt with the transition from the ClassicMac OS to OS X.
Simon Royal (TechSpectrum): Unlike a lot of Mac users, I do remember classic Mac andthe transition to OS X. In the small publishing department I worked for at the time, we hadbeen using OS 9 on a number of G3 and G4 machines. I think that waseven a Performa 5400running Mac OS 8.6. I was using the Performa for simple writing tasks,and as I moved to more design work, the company bought me an iMac G3 (600 MHz 2001 Graphitemodel), and with it came my first taste of OS X - version 10.1. I still remember those first few hours of playing with OS X andthinking, "This is too different." It was radically different from theold and dated (although fast and stable) Mac OS 9, which I was used to.Even for an experienced Mac user, there were so many changes it waslike using a completely new architecture. I remember thinking how Applewas going to transition. Early versions of Mac OS X really weren't up for public release:10.1 was missing so many standard features I am amazed that Apple gotaway with releasing it. From there I moved through each version of OSX. My first home version was with a 450 MHz Indigo iMac G3; it was10.2 Jaguar, which was amassive improvement. My first new Mac - a 1 GHz eMac G4 - came with10.3 Panther, and I hatedit. Okay, so it was more advanced and more feature complete, but it wasincredibly slow and very unstable. At work by this time I was using a 1.25 GHz Mirror Door G4 and it had10.4 Tiger. With Tiger, Applereally excelled; even today it was one of their most successful OSes,partly due to its speed even on a G3 and partly due to it being rocksolid. It is Apple's longest lasting version of OS X at 30 months andamazingly this will run on everything from a 400 MHz G3 all the way upto early Intel machines, showing how versatile it was. 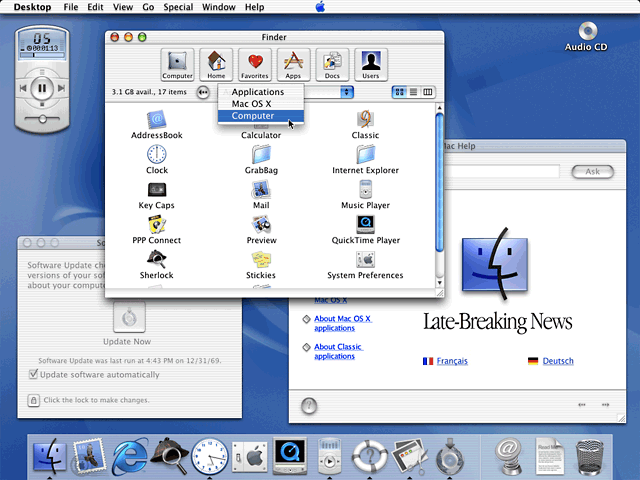 With suchtinysystem requirements, it was a big shock when 10.5 Leopard was released and hiked upthe requirements to a mid-G4, and since then Apple has been cullingmajor chunks of machines with each subsequent version of OS X.
Leopard was great if you had the hardware for it, with some minornew features. From Leopard onward, each version of OS X seemed to bemore tweaks than groundbreaking new features. This was reflected inprice. As of 10.6 SnowLeopard dropping from the usual £129 to a mere £29.99,and the trend continues. Snow Leopard dropped all PowerPC Macs and was a streamlined,Intel-only version of Leopard. The current version, 10.7 Lion, killed off all Core DuoIntel Macs, and the forthcoming 10.8 Mountain Lion is set to killoff even more Macs. I am currently using a MacBook with 10.6, andhopefully once I shed my older PowerPC apps (which Lion dropped supportfor) I shall be moving to Lion or Mountain Lion. OS X has turned in to a fantastic operating system. From those earlyawful days, it has developed and become superb. Steve Watkins (The PracticalMac): Mac OS X gave Apple a much-needed boost in the OS wars. TheMac OS had long been superior to anything Microsoft introduced, but bythe turn of the millennium, things had begun to change. Windows 95 gaveMicrosoft the first OS that could compete directly with the Mac OS.With the introduction of Windows 2000 in February 2000, Microsoft hadcombined the usability of Windows 95 with the stability of Windows NT,and the result surpassed Mac OS 9 (the then-current Apple OS) in theopinion of most. With Mac OS X, Apple leapfrogged past Microsoft, and Microsoft isstill trying to catch up. OS X had the friendly, easy to use andunderstand front-end that had always been more user-friendly thanWindows 95/98 (though, to be fair, far different than the line ofClassic Mac OSes) and more stable than Windows NT/2000. OS X was awinner. For the first time, the typical consumer could leave theircomputer on for days, weeks, or even months, without the need toreboot. Crashes were few and far between. To be sure, this did not happen all at once. Mac OS X 10.0, whilerock-solid in the stability arena, was - to say the least - rougharound the edges when it came to usability. Gradually, Apple polishedthe user interface, which grew friendlier with 10.1 and 10.2, and, inmy opinion, reached the level in 10.3 that it could be called afinished product. I had started intermittently booting straight to OS Xwhen 10.2 came out, but with 10.3, I made OS X my primary boot OS onceand for all. When OS X 10.4 Tiger was released, Apple proving they werenot going to rest on their laurels, made even more improvements on theuser experience. In fact, 10.4 is probably the milestone where mostusers would have pronounced OS X fully ready for prime time. Further tweaks have occurred with each subsequent update to OS X(and some would argue whether they all represent "improvement"). For me, the transition was not all that painful. I had only oneapplication, a scanner driver, that required booting to OS 9. Aroundthe time of the initial OS X transition period, someone wrote a genericscanner driver/program (I can't recall the name of it) that worked withmy Canon scanner, along with dozens of others, thus eliminating my needto boot directly to OS 9. Every other program I relied on ran just finein Classic Mode, the OS 9 emulation that was built in to OS X. The bank where I worked used "fruit" iMacs in our lobbies todemonstrate our Internet Banking product. I was able to switch thoseiMacs to OS X almost immediately, as our online banking worked justfine with most any browser that ran on OS X. The back-end Mac programswe used were happy in Classic Mode, so at work, the transition wassomething of a non-event. Others had a rougher transition, as not all programs liked runningin Classic Mode, requiring some users to either reboot multiple timeseach day or actual run 2 Macs side-by-side, one running OS 9 and theother in OS X, to get their work done. As time went by, most programswere updated to run natively in OS X, and the transition wascomplete. I recently bought a couple of older PowerBooks and plan on using onepermanently, running OS 9.2.2 and OS X 10.4, to maintain compatibilitywith PPC programs left behind by 10.7 Lion. I was booted into OS 9 theother night and had to force-quit a program. The box that popped upstrongly advised me to "restart" in order to avoid further problems. Iignored the warning, and the entire OS locked up shortly thereafter.That was the first time in months I had experienced that phenomena, andit was a reminder not only of how far we have come, but how quickly Itook the OS X Unix stability for granted. Although I do have some fond memories of the System 7, 8, and 9days, I would not want to go back. Some things are best experienced asa memory! "The Macintosh is defined by its interface, and anyredefinition of that must be at least as good as what it's replacing.Mac OS X Public Beta does not reach that goal." That said, it was a great way for Mac users to get a glimpse of thefuture - and a great way for Apple to get feedback on the firstcomplete overhaul of the Mac OS ever. The first release version wasbetter, but still far from ready to become anyone's primary operatingsystem. Version 10.1 moved closer to that goal, and with 10.2, wereached the point where OS X had become very usable as your primaryoperating system. And some of that sluggishness haddisappeared. With version 10.2 (Jaguar), OS X became very usable as your primaryoperating system. OS X had two strikes against it: It was somewhat similar to theclassic Mac OS yet different enough to be disconcerting, and it waseven more different from Windows to the point that it could feel veryalien to a switcher. Many of us struggled with the transition from MacOS 9 to OS X, helped along greatly by Classic Mode, which let us runour old familiar software. And most of us finally settled into OS Xwith Jaguar. Version 10.3 Panther gave us even better Classic Mode performanceand may well have been the fastest version of OS X, because 10.4 Tiger,which was otherwise every bit as fast, introduced two new features thatwere always running in the background, Spotlight and Widgets. Bydisabling those two features, made easier by third-party utilitiesdesigned specifically to turn off one or both, Tiger could run verynicely on slower, lower memory systems. OS X 10.3 Panther gave us Safari, improved speed, and the best Classicperformance yet. But the biggest thing about OS X is that it changed how we work forthe better. For the first time, the Mac OS and new apps could take fulladvantage of dual processors, and when one program locked up, it veryrarely took down the whole system. Software written for OS X could us asystem-wide spell checker, and with the introduction of Safari,programs could use WebKit to display HTML content - no more need toreinvent the rendering engine. The transition to OS X was slow. Some users had to wait for yearsfor a favorite app to become available in an OS X version. But in theend, the switch paid off, and it paved the way for Apple's next step,switching to Intel processors in 2006. Dan Bashur (Apple, Tech, andGaming): I was certainly well exposed to the "Classic" Mac OS andused variations of System 7 to the final builds of OS 9 dailythroughout high school and most of my college years. By 2001 though, Ihad heard plenty about Mac OS X and the sleek new look it was going toprovide to the user interface, while offering new features and backwardcompatibility to older software. It was at this time, after using theMac labs at The Ohio State University and Dad's collection of machinesfor many years, that I decided to get my very own Mac. It was September2001; Mac OS X had already been out for a little while, and Macs werenow shipping with OS X 10.0. I really wanted a G4 Quicksilver tower, but theprice of the tower and a suitable monitor was a bit prohibitive, so Idecided on a more affordable 600 MHz GraphiteSummer 2001 iMacG3. Despite the fact that the flat panel iMac G4 shippedmonths later and the iMac's price was dropped by $300 (that still burnsme up), I was quite pleased with my iMac G3 and even this early versionof Mac OS X. It was visually pleasing and much more modern lookingcompared to OS 9, but it was not the complete revolution I had expectedtechnologically. As fresh as OS X seemed, it was a bit rough around theedges, and OS X dedicated application development was in its earlystages. It was kind of cool though to be able to dual boot and switchback and forth between OS 9 and OS X as needed. It made you feel a bitmore geeklike and allowed you to get comfortable with OS X at your ownpace. As with anything that requires change and transition, I foundmyself more comfortable using Mac OS 9.2 as my default operation systemat first, but at the same time during this transitional time I wasslowly acquiring applications designed to take advantage of OS X. Things took a dramatic turn for me (and I suspect many otherlongtime Mac users) when Mac OS X 10.2 Jaguar was getting ready toarrive, which I preordered after hearing lots of praise from thedeveloper community on how much better performance was compared to 10.0and 10.1 (which I passed on). The hype turned out to be true, and thevisual presentation of Jaguar was also much cleaner, along with theintroduction of several new features (such as Quartz Extreme - althoughI could not take advantage of that with my Rage 128 Pro in the iMacG3). In my opinion, Jaguar was the first version of Mac OS X that couldreally replace OS 9 as your default Mac OS, but it would not prove tobe the ultimate replacement. Mac OS X 10.3 Panther added even moreenhancements, but version 10.4 Tiger would prove to be the ultimate OSfor PowerPC Macs. Sadly, as each version of OS X came and went, I foundmyself booting into OS 9 less and less frequently, and by the timeLeopard arrived (which dropped support for OS 9 entirely), I was onlybooting into OS 9 a few times a year on my Macs that supported it justto take a quick trip down memory lane. Fast forwarding to today and a time when I now have a Core i7MacBook Pro that is many times more powerful than my original iMac G3.You would have thought that I would have completely forgotten about OS9 and moved on entirely to Snow Leopard and Lion in an age when PowerPChas all but been completely left behind by Apple. Not so! The irony isthat now that I have that kind of power, I have found myself wanting torevive my PismoPowerBook, mainly for OS 9 applications, games, and as a learningtool for my son. My iMac G3 is even set up again and will probably bean iTunes jukebox or classic gaming device once again. These decisionshave come partly out of a desire to give a bit of a history lesson tomy son, showing him how the Mac and its operating systems have evolvedover the years, while also giving new life to some of my most cherishedMacs in a fresh breath of nostalgia. Mac OS X is now 11 years old, and OS 9 is even older, but at the endof the day it all comes down to using what works best for your needs ata given moment. Some users will always run the latest version of Mac OSX and just have one or two Macs in operation, since their applicationdemands are minimal, but there are longtime power users who may haveseveral Macs in operation using OS 9 and multiple versions of OS Xrunning to cover all bases. With 11 years of OS X development, youcertainly have a variety of Macs, many versions of Mac OS X, and awealth of applications to choose from to fulfill your productivity andentertainment needs. Use what works best for you and provides the bestvalue - it's the Low End Mac way! Allison Payne (The BudgetMac): My first experience with OS X was the early days of Tiger,and I hadn't touched a Mac since 1996 at that point, so I missed theentire transition period. What I remember thinking when I first used Tiger was that it wasso much more like Windows thanthe classic OS had been. It had context menus! It seemed much morelikely to pull in the Windows crowd, and indeed, Apple's entire "I'mand Mac; I'm a PC" ad campaign was created with that goal in mind. I had been dubious about Mac OS in high school and college simplybecause it didn't seem to let the user have the control over the systemthat Windows let you have with DOS at the Command Prompt. Then,ironically, Microsoft truncated the DOS underpinnings of Windows, justabout the time OS X started shipping - with the full power ofUnix/Linux commands at your fingertips. That much control over customization, accessibility, and plainusability made OS X the king of operating systems, easily trumpingWindows and its own Mac OS roots. I still have a great deal of fondness for System 7 and 9, but I'mglad Apple has continued to evolve.